For those of you who didn’t catch Dr. Felasfa Wodajo’s previous review, the Clinical Orthopedic Exam (CORE) app is a multimedia source of over 250 different musculoskeletal physical exam maneuvers. It is indexed by body area in picture and text format, is comprehensive and very well referenced. It’s certainly not your average app. 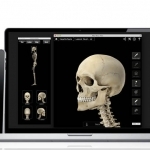 The NOVA series by 3D4Medical are rapidly becoming the de facto choice for anatomy visualization on the iPad. Muscle System Pro III is no exception and is a significant update which brings a host of useful features. 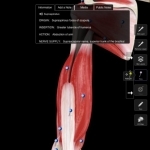 This app is ideal for visual learners and anyone wishing to get a detailed glimpse into the musculoskeletal system. 3D4Medical are highly regarded in the medical app industry. Their apps have gone from strength to strength winning awards and featuring in many Apple commercials as a demonstration of the capability of the iPad as a platform. iMedicalApps was able to exclusively catch up with John Moore, CEO of 3D4Medical and find out more about the NOVA series and plans for the future.